COMPLETE ENROLLED AGENT EXAM COURSE Prepare for EA Exam Success. Integrated IRS Forms and Publications, Excel, and more! Pass your exams with a course that helps you make better decisions as you study. Real-time analytics, advanced study tools, and focused materials make this the #1 Enrolled Agent exam prep course. As you study, we track your performance level and confidence in each topic, showing you where to invest your time. No other course is this precise. Combined with EA practice exams that are timed and structured like the real thing, you’ll know exactly when you’re ready to pass. 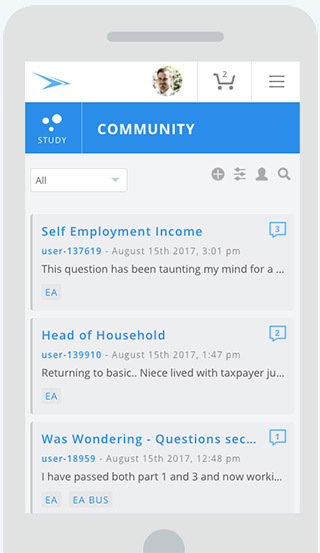 Connect with your instructors and fellow students in the Community and get help with difficult EA exam topics. Whether you’re reading your textbook, watching a lecture, or practicing study questions, we bring the conversation right to you. We won’t insult your intelligence with unreliable pass rates or twisted statistics. We certainly won’t make payments to shady review sites to rank us as “2018s Best Enrolled Agent Course.” Marketing gimmicks and fake reviews won’t help you pass. You deserve the highest quality instruction, the most advanced technology, and the absolute best support until you pass all of your exams. Give us the opportunity and we will exceed your expectations. Our goal when we first got started was to write the best enrolled agent course ever made. In that pursuit, our original IRS Enrolled Agent Study Guide quickly became the gold standard for EA review courses. Building on our previous success, we have continued to revolutionize the way study material is presented and retained. Our patented technology allows us to pinpoint strengths and weaknesses with a personalized learning experience that is unique to each student. What this means is aspiring Enrolled Agents using our coursework focus only on the most crucial material needed to pass the exams and do so in less time with less hassle. Fast Focus Review Create the perfect final review. With just a click, you can condense the entire course to just your weakest areas. Integrated IRS Publications IRS publications are accessible right from your study tools, so you won't have to waste time searching for them. Online Community Connect with your instructors and fellow students from anywhere in the course and get the help you need, when you need it. Access Anytime, Anywhere The course is desktop, tablet, and mobile friendly, so you can study from anywhere with just your web browser and an internet connection. Expert Instruction Master the key concepts with 10 hours of instructor-led video lectures. Over 45 lessons simplify the difficult topics for increased comprehension and retention. Video lectures reinforce the reading material and practice questions for an efficient, streamlined learning experience. Intelligent EA Textbooks Your performance guides you throughout the enrolled agent course, whether you are in the textbook or answering quiz questions. We analyze your study activity to better understand how well you know the various topics covered on the Enrolled Agent exam. Simulate the Enrolled Agent Exam Get the confidence you need to pass the first time. Our exams are as close as you will get to the real Enrolled Agent exam. If you can pass with us, you can schedule the official IRS exam with confidence. What makes this the best Enrolled Agent review course for me? How is your approach to EA exam prep different? Our Enrolled Agent Exam Review provides you with the essential material you need to pass and leaves out unnecessary information that would only bog you down. This focus allows our students to excel on their exams, often passing all three on the first try. How do your EA exam review lectures work? 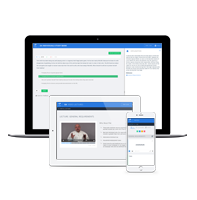 Access over 10+ hours of engaging video lectures with over 45 concise lessons. We break down the important topics that you need to know with 5-20 minute lessons which use real-world examples to explain difficult EA exam topics. What type of review questions does the Enrolled Agent exam course include? Can I filter my Enrolled Agent review questions to focus on specific sections? Can I create flashcards and take notes for review? Yes! With our built-in creator, you can takes notes and create customized Enrolled Agent exam flashcards for review. How are updates delivered to my Enrolled Agent exam prep? As new content becomes eligible for testing on the EA exam, we will update your online EA review automatically and at no extra cost to you. We guarantee course access and updates until you pass. Will my EA prep course expire? No. We believe that EA prep should be there for you when you need it. For this reason, we include course access and updates until you pass your EA exam. How do you use the “Fast Focus” feature in the enrolled agent course? Use Fast Focus to narrow your review in the EA study bank or online textbook to the areas that could help you most when you take the actual Enrolled Agent exam. With one click, you can zero in on all of the areas that could have the biggest impact on your EA exam score. We call this feature “Fast Focus” because it allows you to concentrate on the most important questions and content. This feature is most helpful after completing the questions for each chapter, and in the final review before you take your test. The online enrolled agent exam course helps you learn more efficiently, utilizing an intelligent online textbook, thousands of EA review questions, and unlimited practice exams with subject analysis and advanced reporting. Instructor videos are available for many of the most difficult exam questions. 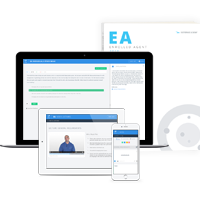 This complete course for all three Enrolled Agent exams includes the paperback edition of the EA textbook plus access to all of the questions and advanced technology of our online enrolled agent exam course. Focus on the right topics with clear recommendations on where to invest your study time.